Mariners outfielder Milton Bradley has been designated for assignment, which means the team has 10 days to trade or release him, or outright his contract to the minor leagues. Seattle recalled 24-year-old outfielder Carlos Peguero. The disappointing, tortured tenure of Milton Bradley with the Mariners finally came to an end Monday after an embarrassing series of events that occurred over the weekend. Bradley was designated for assignment, along with outfielder Ryan Langerhans, as the team called up outfielders Mike Wilson and Carlos Peguero to replace them in time for a series that starts Tuesday in Baltimore. As for Bradley and Langerhans, they must be released, traded or outrighted to the minors within 10 days. The moves come after the Mariners scored just two runs their final two games — both losses — against the Chicago White Sox, while Bradley generated negative headlines during all three days of the series. 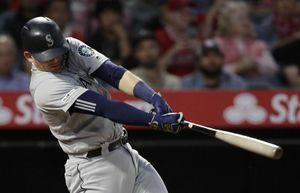 On Friday, Bradley was ejected in the eighth inning of a tie game for arguing a strikeout, leaving the Mariners with a short-handed bench that prevented them from pinch-running in a key situation. Bradley was booed after failing to get to several balls hit his way Saturday. Then on Sunday, his poor throw led to a disastrous chain of events and two critical Chicago runs on the same play. 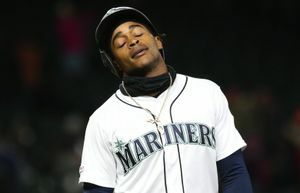 “We just felt that Milton was not part of our future and he is not part of our present,” Mariners general manager Jack Zduriencik said in a conference call with reporters on Monday. Zduriencik said there wasn’t “any particular instance” that led to the decision, but that he and manager Eric Wedge agreed something had to be done. Mariners president Chuck Armstrong and CEO Howard Lincoln also signed off on the move after a conference call in which Zduriencik laid out the reasoning. Asked to elaborate, Zduriencik said such internal discussions were private. He also could not say whether Bradley was having a negative impact on the clubhouse of a team that has managed to win eight of its past 12 games. Wilson and Peguero are expected to split time in left field. The addition of Wilson gives the Mariners a much-needed right-handed bat, and Wilson can also be used as a designated hitter to complement left-handed Jack Cust. “It’s a nice opportunity to give both guys a shot in left field right now,” Zduriencik said. Michael Saunders remains the center fielder despite an 0-for-24 slump. In an interview before his conference call, Zduriencik said he hopes to have center fielder Franklin Gutierrez return to the team in about a week to 10 days. Gutierrez has embarked on a Class AAA rehabilitation assignment as he tries to recover from a mysterious stomach ailment — eventually diagnosed as irritable bowel syndrome — that sidelined him for most of spring training. Zduriencik added that Wilson could also fill in for Saunders in center field. In the case of Langerhans, who could clear waivers and be kept in AAA by the team, Zduriencik said his defense and flexibility were a bonus, but the team simply needs more offensive production. The absence of Gutierrez has left the team particularly vulnerable against left-handed pitchers, and Zduriencik has known since spring training ended that he needed another right-handed bat. Seattle has scored just 23 runs the past nine games, a flaw largely obscured by the team’s 5-4 record during that period. But scoring just five runs in three games against the White Sox — the team with the worst record in the American League — seemed to be the final straw. The jettisoning of Bradley officially ends the saga of the bizarre Carlos Silva trade to the Chicago Cubs in December 2009. Both teams hoped Silva and Bradley would find new life with a different team, but instead seemed to outdo one another in terms of on-field and off-field problems. “At this point in time, it hasn’t worked out for either club the way either one of us was hoping,” Zduriencik said. Silva had a solid record for a couple of months early with the Cubs, then degenerated into a pitcher who couldn’t make the team out of spring training this year. When Silva popped off about a demotion to the minors, the Cubs released him. He is now in Class AAA with the New York Yankees. Bradley never got his bat going in Seattle and stormed from Safeco Field during a game a year ago this month. The next day, Bradley asked the team for help dealing with undisclosed personal problems and was placed on the restricted list. Two weeks later, in a wide-ranging interview with The Seattle Times, he said he was getting personal counseling because of “unpleasant thoughts” that sometimes included suicide. But Bradley never regained his on-field form after he came back. This past winter, he was arrested for making criminal threats against his wife. The Los Angeles City Attorney’s Office agreed to forgo criminal charges in favor of Bradley and his wife participating in an out-of-court hearing process. Bradley’s wife, Monique, has since filed for divorce. This season, Bradley is hitting .218, and most of his hits the past two weeks have come on slow ground balls and bloopers. His left-field defense, by most advanced metrics, ranked among the worst in the league. Toss in two ejections six days apart, caused by Bradley’s inability to control his temper, and the Mariners’ move Monday seemed inevitable. How Milton Bradley did in his two seasons with the Mariners and his 12-season career totals. Year Team Games AB R Hits 2B 3B HR RBI Avg.